It’s the morning and we are, for once, on track to arrive on time. Kids dressed, bags packed, about to step out into the chill Autumn air. Kids lined up neatly. I am the perfect parent. We are the Sound of Music. I glance at Celeste to see her beautiful ivory hair. Not so beautiful. It is less than elegant. In fact, it resembles a straw jungle. Think “wind swept gone wrong”. No worries, I think, 2 seconds with the hair brush will sort it out. Five minutes later, after kicking and shouting and screaming, we are now late. We are the Sound of Music played by a flock of distressed sheep. Her hair is still a disaster zone. Having 3 boys and a girl, I’ve never previously worried about how to brush hair. I’ve simply cut it short and that’s it. I’m not sure that technique is going to cut the mustard with my little princess and her snowy white baby hair. She has really fine hair and brushing it is a nightmare. 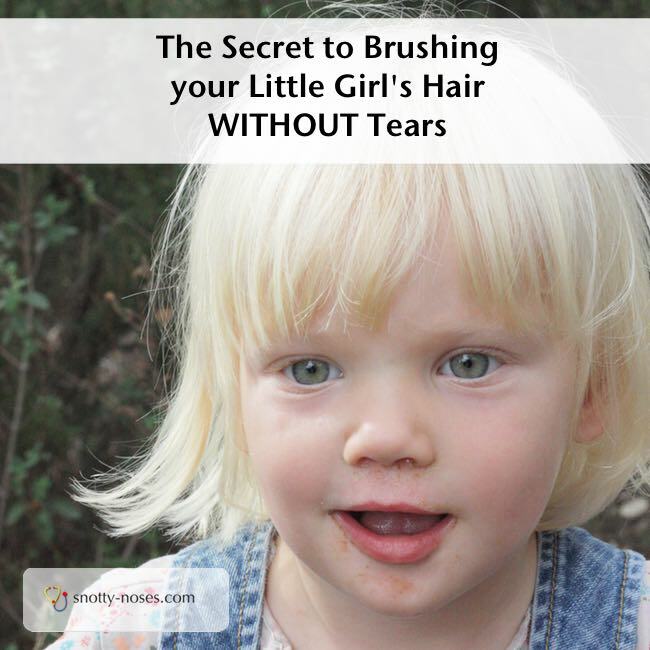 Until I discovered the secret of how to brush my daughter’s hair without tears. I have to confess at times, we would drop her off at nursery without daring to reach for the bristly thing. At times, she’d come back with beautifully quaffed hair, in two little bunches. Look at my “cuitas!” She’d dance around admiring herself in the mirror. Except, when I tried to do super cute cuitas (pony tails), you’d think I was giving her a leg wax. With super glue. I even went as far as to buy her a little pink brush and some hair clips. She loved the clips. So much so that she lost them all in ONE day. I gave up on that idea. I could see it becoming an expensive habit. So life went on with our daily battle to get her looking respectable for school. I considered applying the “boy hair style”. She’s a modern girl right? Quick and convenient. It’s still my backup plan. Then one morning, it happened. I discovered the secret. The secret to tear-free hair brushing. 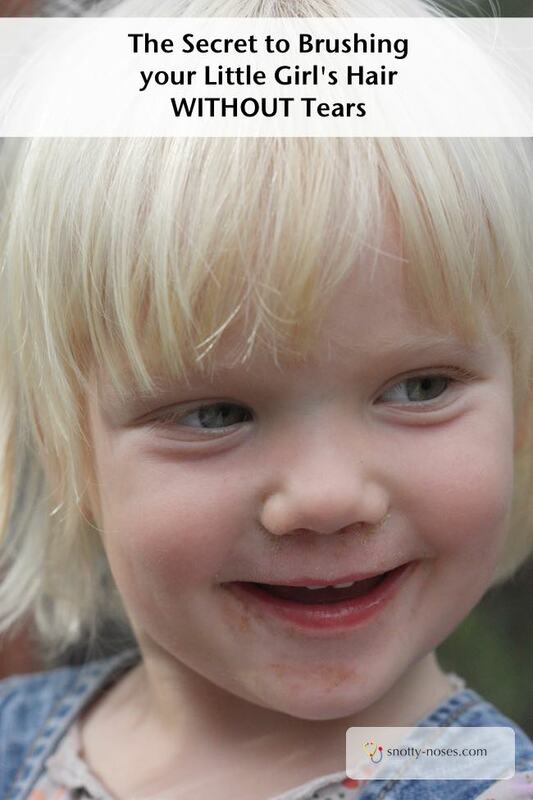 I’m always encouraging the toddlers to use words rather than shrieks. The shrieks get a little wearing. This particular morning, she used words. She actually told me what the problem was. That was it. Our epiphany. The white fluffy stuff fell from my eyes. Blankets of it. No more hair brushing battles. I cover her ears with my hands and brush her hair. Did you miss it? That’s it, it’s so simple! I cover her ears with my hands. Don't wash every day. It strips the hair of it's natural oils. I only wash the children's hair once a week. Distraction. Read a book, watch a youtube movie, play with a toy. Now it REALLY does only take two seconds to brush her hair and we’re done. For approximately 2 nanoseconds each morning, we really do look like the Sound of Music. Neat and Tidy.